You know that you're a terrible blogger when you don't even blog about YOUR OWN patterns. Jeez. Last week, I was testing a new pattern and a new e-store, Meylah, when Meylah accidentally tweeted the pattern before I was ready. Oops! After that I had to rush to get everything ready, plus finish packing and sewing for a trip I was going on the next day. It was super busy to say the least. There have been lots of very inspiring cross stitch patterns popping up. You may have seen the cute dessert of the month patterns from Frosted Pumpkin Stitchery or perhaps something on Pinterest. I just can't get into the hand work though. I've tried! It's just not for me. 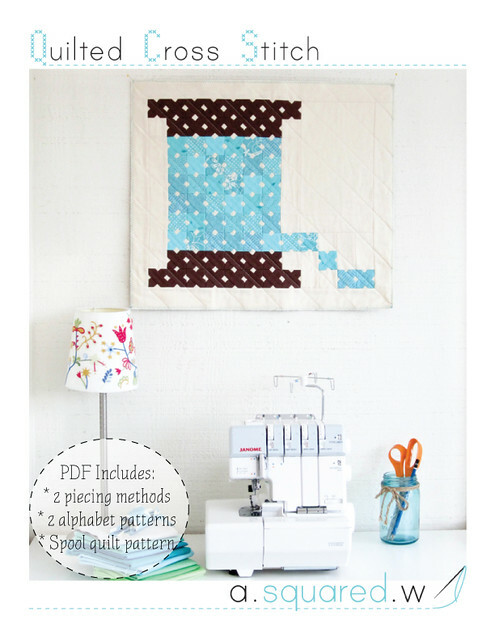 So I took the idea and applied to to quilting! 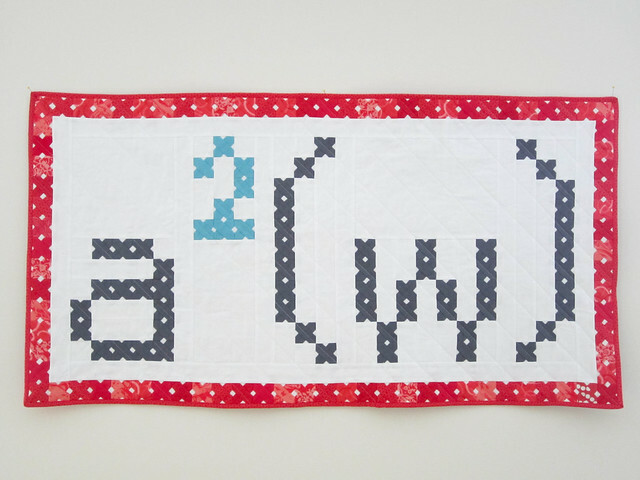 I changed my header recently, but my logo is still a cross stitched a²(w). This "mini" is 23" x 43". The letters are solids, but the border is made up of prints (the red got blown out). I LOVE it. I took everything I learned making this guy and turned it into a pattern. The Spool mini measures 18" x 21". 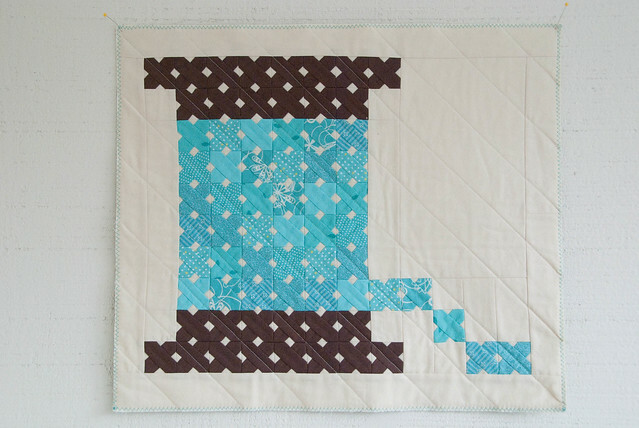 The "spool" is made of solid brown and the "thread" is made up of different aqua prints. I wasn't liking how any of the bindings looked, so I just zig-zagged the edges in aqua. I quilted it along the diagonals. Linking this little guy up to Modern Minis. 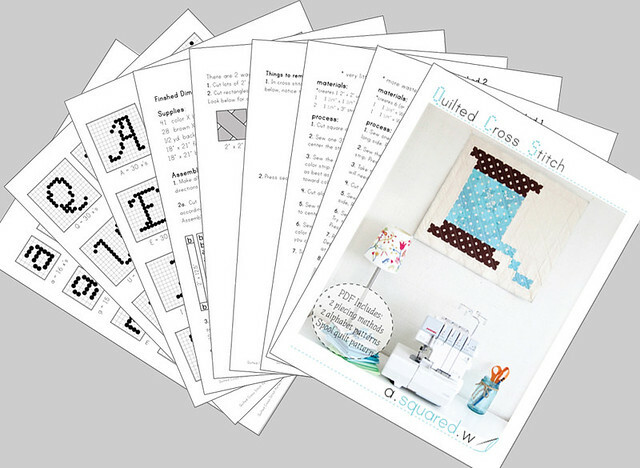 The pattern includes 2 ways of piecing the tiny 1.5" "stitches", 2 alphabets, and the spool pattern. It's available on Meylah for $4. Not bad for a 9 page pattern! I agree with Katie, this pattern is completely awesome! Your head never runs dry of awesome ideas, does it? Love this, Ali. Great job. that is the cutest thing! What a fantastic idea - off to buy the pattern right now! That is a great pattern idea, thank you, I have just purchased it. Aw, it's so cute! I'm getting one too, yippee! I'm buying! There is literally no end to the things you can do with that "stitch"! And I love the fact that the pattern is reasonably priced, I saw a simple 3 piece pattern for a pair of cowboy shaped baby booties at Cottontail's opening on Saturday. I stood there for 20 minutes, hemming and hawing, but in the end just couldn't (wouldn't) spend $10 on it - it seemed crazy. This is perfect and I can't wait to sew it up. Thanks!! 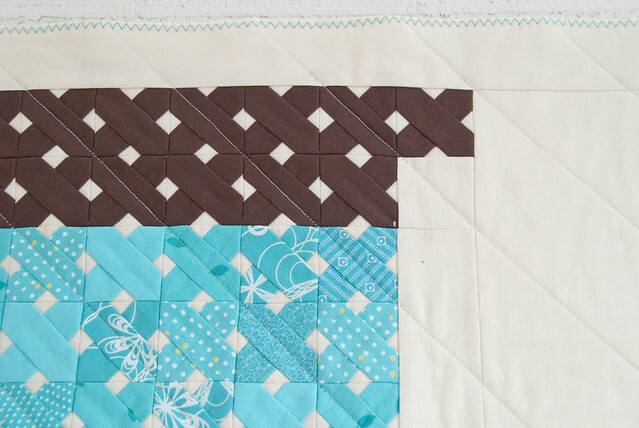 Love the cross stitch/quilting fusion here! I will be purchasing as well. Too cute! I saw this pattern on I Love Orange Too and am heading over right now to buy it! Thanks for something totally different and absolutely enchanting! I found this on I love Orange Too and got it. Very cool pattern and super good price! Lots of impossibilities.thank you! WOW. great ideas! love your work, the things we can do with fabric, thread and imagination!!! !